I’m going to be starting maternity leave at the end of today, but our developer Mike Kelly will be watching my blog comments to respond to questions and thoughts on this. We’re also working to get our mailing list fixed so this can be discussed there as well. Do you have this lovely yellow Affiliate button hosted on your website or blog? If so, this post is for you. As we are updating the look and functionality of the new site (check out some of the features coming on the Affiliates wiki), we’ve found a better to way to make smart banners work. 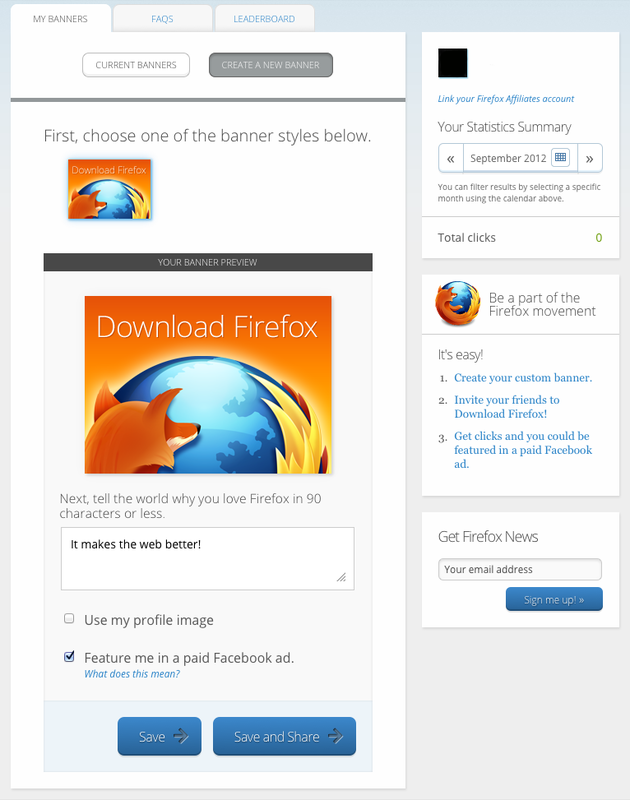 Smart banners detect the version of Firefox that a visitor to a website or blog is on. If they’re on an older version, they get an update message. Up to date? They get a Firefox brand message. It’s a pretty neat feature and we’re hoping to have more banners that work like this in the future. However, the Affiliates dev team has decided to change how we make the update banner work. Previously, your banner embed code would point to a special image on the Affiliates site that changes depending on the browser version of whoever is viewing it. In the new system, the banner embed code detects to user’s browser and changes the image to point to the upgrade banner if necessary. We’re making this change because the old system was difficult to maintain and difficult to extend to other banners. With the new system, it will be easier for us to release new banners that do more than just switch images based on the viewer’s browser, meaning a larger selection of banners for you to choose from. The downside is that, after the change, existing smart banners will not longer switch to the upgrade message. Users will always see the “Different by Design” brand image. There are only a select number of Affiliates using these banners and I will be sending notifications to all of these users directly to warm them of the change when the new site launches later in the spring. At that point, they can replace the embed code on their sites with the new banner. Have any concerns or questions about this change? Drop us a note at affiliates@mozilla.org or drop by the #affiliates irc channel. The Firefox Affiliates program was launched in 2011, acting as a hub for banners that Firefox and Mozilla supporters can add to their websites, blogs and Facebook walls. The system is available in more than 15 languages and affiliate buttons are available in more than 30 (Yes, Mozilla localizers are the best). The site has driven millions of clicks to download over the last two years. So it is with great delight that I share that the time has come to update and enhance Firefox Affiliates. Affiliates have been writing in with suggestions for how we can improve the system and now the time has come where we can put that feedback to use. It is also time for you to speak up and let us know what would make the Affiliates experience great for you. Requests so far include adding more types of banners and links to the system, gamification for participation, a better mobile experience and options for banner customization. If would be hugely helpful if you could fill out this survey to help us prioritize where we want to put our energies first. There are about 100,000 use registered as Firefox Affiliates so another priority will be surfacing other opportunities for them to support Firefox and Mozilla beyond hosting a banner. They have already taken some action as a supporter, so we will be doing a lot of thinking about what other interesting activities to invite them to participate in. We will also be updating the visual design of the program, bringing it in line with the Sandstone branding that all Mozilla sites use. All in all, 2014 is going to be an exciting time for the Affiliates program. If you have thoughts, please fill out the form or leave them in the comments. You can also find us in #affiliates on IRC. Last week we launched the Firefox Affiliates Facebook app! This app gives millions of Firefox fans on Facebook the chance to be part of the Affiliates experience and share Firefox easily with their friends and family. If you’re on Facebook, install the app on your profile today, create a banner telling the world why you love Firefox and then share it on your timeline or invite Facebook friends to download Firefox directly. If you opt in and get more than 50 clicks, we may feature your Affiliates banner as a paid Facebook ad. You can even link your Facebook Affiliates account to your account on affiliates.mozilla.org and have any clicks you get on Facebook count towards your leaderboard stats. Thanks to our always excellent localization teams, the Firefox Affiliates app is available in English, French, German, Spanish, Brazilian Portuguese, Traditional Chinese, Polish, Dutch, Albanian and Klingon. (Okay, not actually Klingon. I was just making sure you were still paying attention.) If you’d like to localize the app into your language, please let me know. We’d be happy to add it. 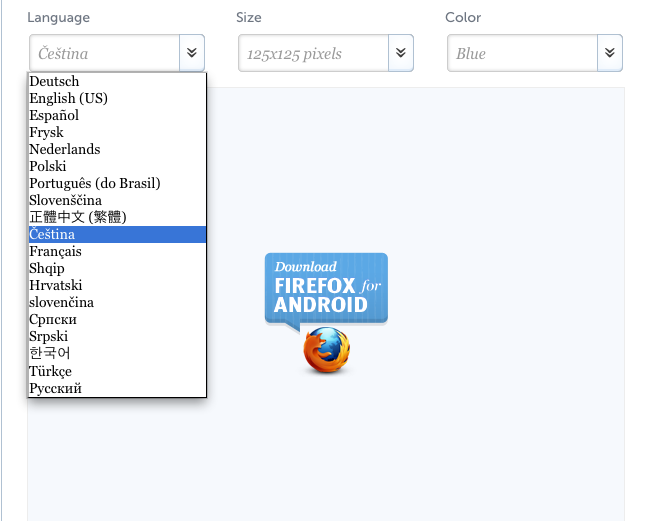 Thanks to our fabulous Russian localization team we now have Firefox Affiliates available in Russian! Ура! In other Affiliates news our amazing development team have made it possible for us to have buttons available in a locale even if the Affiliates website isn’t available in that locale. What does that mean in human speak? If you’d like to be an Affiliate, but we don’t yet have the website localized for your language, but we do happen to have some buttons built in your language, we can get those to you. To see if there’s a button in your language, sign up for Affiliates in one of the 19 existing website locales (hopefully you’ll understand one of them) and then when you’re building a button, check the language selection drop down to see if the button is available in the language you’re looking for. We’ll be adding buttons like this in the next few weeks (keep your eyes on the Firefox for Android category in particular). As always, if you have translation skills and you’d like to add your language to Affiliates, please send us a note at affiliates@mozilla.org. If you don’t have time to translate the entire site, but want to make sure the buttons are available at least, drop us a line and we can work with you to build those buttons too. Tragically, there are millions of Firefox users out there using older versions of Firefox. Their reasons are varied and personal. We get it, change is hard. But know this: Upgrading to the latest Firefox is free and easy, plus it gets you a faster, safer and more stable browser. It’s a scenario full of win. If you’re a Mozillian reading this post, then you already get it. You know that new releases of Firefox bring a bounty of innovations, gifts and delight. You also know that part of our job as Mozillians is to help users find their way to the most recent version of Firefox that’s out there. If you’re a Firefox Affiliate (and really, why wouldn’t you be?) we’ve launched a new kind of button to help you help the masses get up to date. 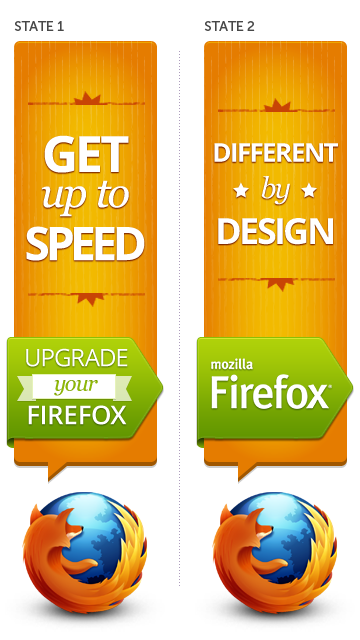 These upgrade buttons display a different message depending on whether or not you’re using the most recent version of Firefox. If someone visits your website or blog using an older version of Firefox, they’ll get an upgrade message and be directed to the upgrade Firefox download page. The most recent version Firefox or a different browser (gasp!) and a Firefox brand message appears. 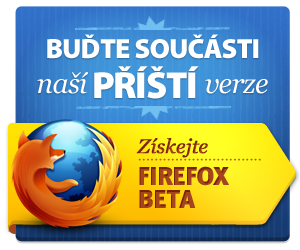 Visitors who click on this message are directed to the main Firefox download page. This button is available in 250×300 and 160×600 pixel sizes and is currently only available for the EN-US locale. We’re hoping to roll it out to the other 17 Affiliates locales in the new few weeks. Special thanks to Antony Ricaud and Ty Flanagan for coding and design magic for these buttons. Keeping up the good news today, the Affiliates team would like you to know that the beautiful blue Firefox Beta buttons for desktop and mobile are now available in all Affiliates locales. So pretty! So blue! So Beta! By using Firefox Beta you can have an impact on the next version of Firefox and the 450 million people who use it every day. If you can get even more people to help test, refine and polish Firefox by adding a Beta button to your website or blog, that’s like an extra, double-plus, bonus, very good thing. 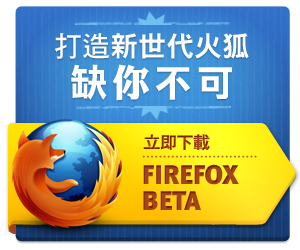 Become a Firefox Affiliate and get your Beta buttons today!